ABC just doubled the number of Asian American families on prime time network television. That's two! ABC just doubled the number of Asian American families on primetime network television. The network's 2015-16 slate of new shows includes Dr. Ken, starring and executive produced by Ken Jeong. Inspired by his own experiences as a real-life doctor, Jeong stars in the multi-camera comedy as a brilliant but frustrated HMO doctor juggling, medicine, marriage and parenting -- and succeeding at none of them. 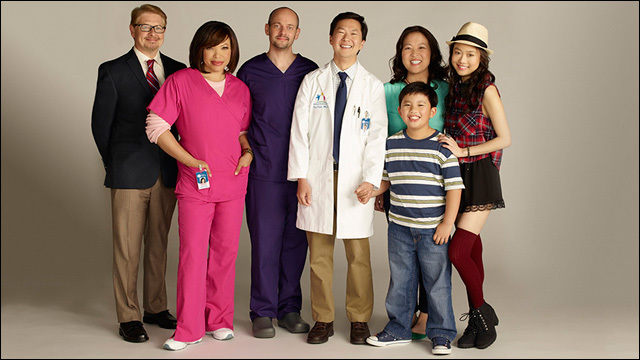 Dr. Ken stars Ken Jeong as Dr. Ken, Suzy Nakamura as Allison, Tisha Campbell-Martin as Damona, Dave Foley as Pat, Jonathan Slavin as Clark, Albert Tsai as Dave and Krista Marie Yu as Molly. Produced by Sony Pictures Television and ABC Studios, Dr. Ken was written by Jared Stern, Jeong and Mike O'Connell, and executive produced by Stern, Jeong, John Davis, John Fox and Mike Sikowitz. In case you hadn't heard, ABC also renewed Fresh Off The Boat for a second season. I crunched the numbers, and if my calculations are correct, that means there will be two Asian American families on prime time network television next season. Whaaat. People, I don't even know what world we're living in anymore. But I like it.